I am not a shopper. I am especially not a good deals kind of shopper. Not because I don’t love finding a good deal. I just don’t have the time in my life to hunt and search for deals. There are far better ways that I can use my time. Digging through overloaded racks at discount and consignment shops hoping to find anything remotely cute, in my size, and at a good price just makes me angry. It should not be so hard and time-consuming. Most of the time, I’m willing to pay more to save time or I choose to sacrifice quality for the sake of convenience and affordability. Shopping online, however, is a whole ‘nother ball game. I don’t have to dig through endless racks of junk hoping to find a treasure. I can search and refine and compare prices all with the click of a button. And I can do it all from the comfort of my warm cozy bed. Within a few days, my purchases arrive on my doorstep and I never have to leave my house or talk to an annoying salesperson (or worse, an over-extroverted fellow shopper). Hallelujah! 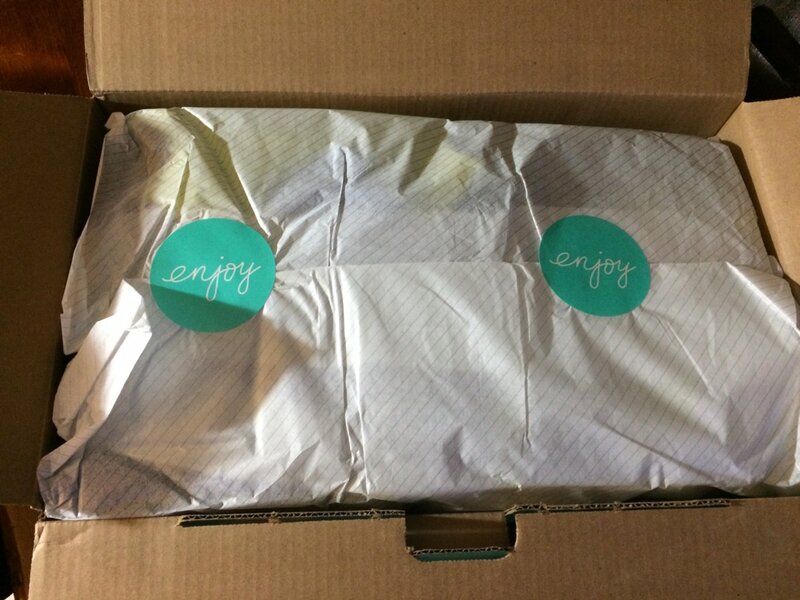 This, my friends, is why I have fallen head over heals in love with thredUp. 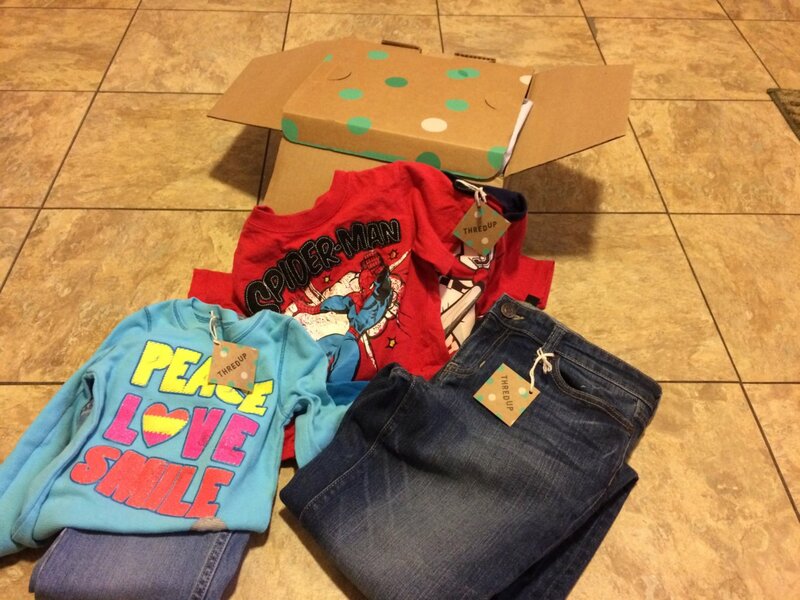 thredUP is an online consignment store that sells top quality secondhand clothes for women and kids (sorry guys). Let me be honest, when my kids (or often myself) need new clothes we usually just pick up something from Target or Meijer while we’re picking up the groceries. We are that into convenience. This is not a dig at Meijer or Target clothing, we love the stuff. But sometimes, it’s nice to expand your horizons a bit. Sometimes I want some really good quality jeans that I know will last for years. Sometimes I want my kid to wear a shirt that every other boy in his class isn’t already wearing (apparently his entire school is full of Target fans). But the idea of going to another store (or two or three) just gives me hives. I do not have time and I’m never sure if I’ll actually find what I’m looking for, at a price I’m willing to pay. 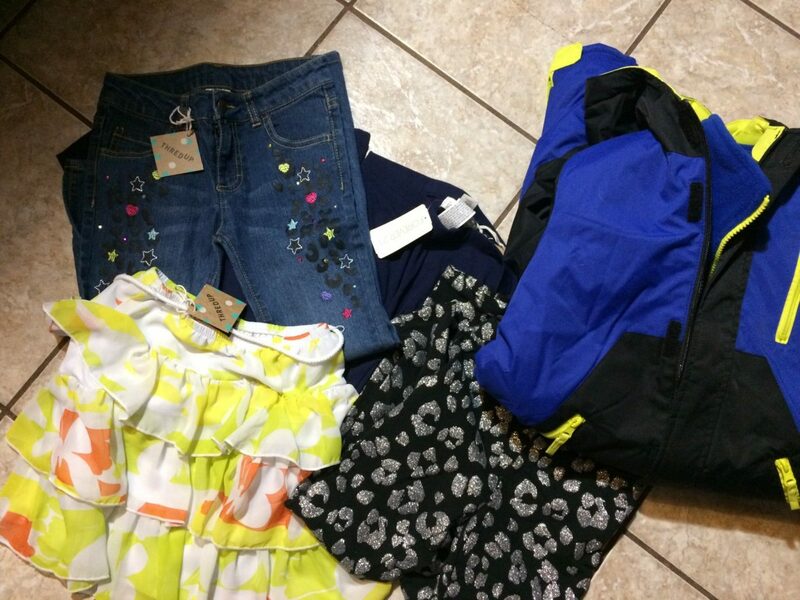 Enter – thredUp. When I notice that my daughter’s shirts are all nearly showing off her belly, I just grab my phone, tap a few options to find exactly what I’m looking for and I find literally hundreds of great new shirts in her size to choose from, at prices that I love. 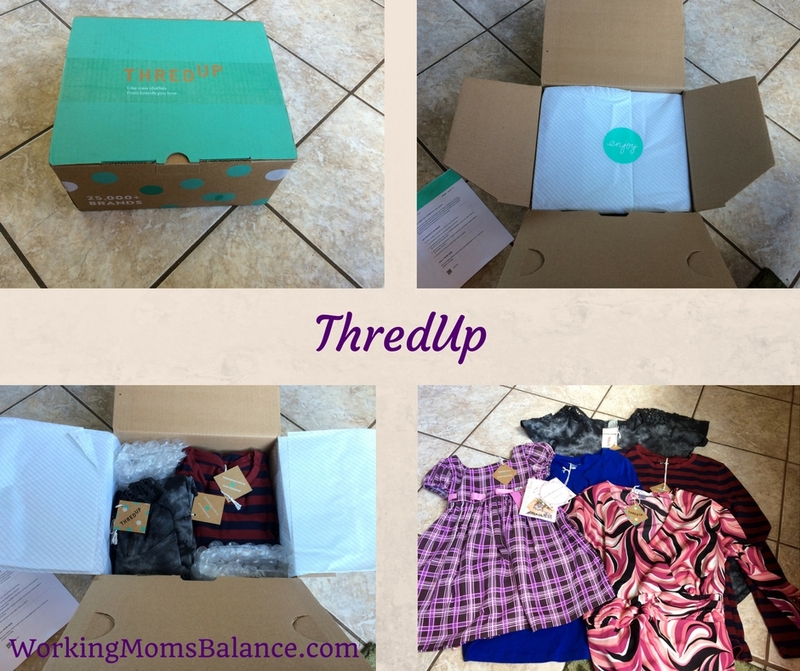 I have ordered clothes from thredUP several times over the last couple of years and I have never been disappointed. I love that I can find name brand clothes discounted up to 90% off. I would never pay full price for most name brands, but I do recognize the additional quality that comes with some brands. Secondhand clothes are the perfect solution, especially if I can order them online instead of digging on overloaded racks. One of my favorite things about thredUP is that you can get brand-new with tags items for insanely low prices. 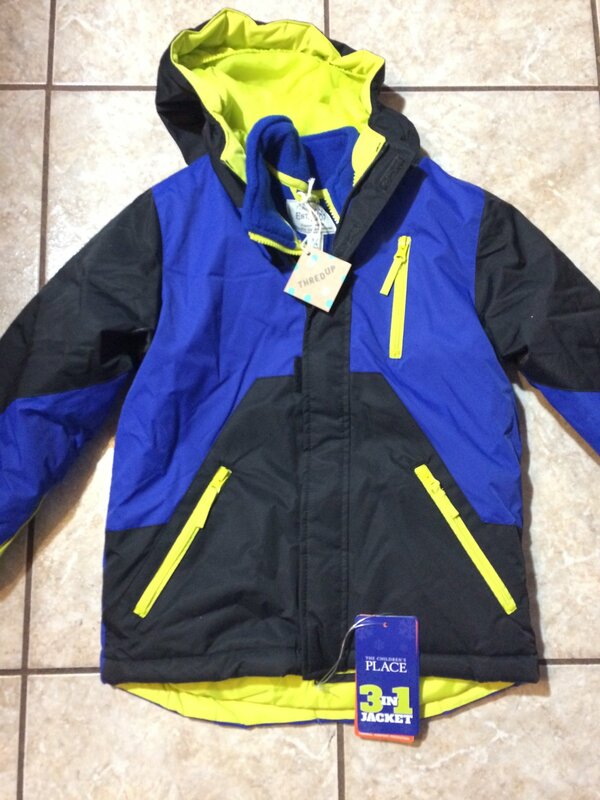 I recently scored my son’s brand new winter coat for well over 50% off the regular price. Maybe I am a good deals shopper after all. In our house, we never take our kids to the store unless we absolutely must. It is far easier to have one parent stay home with the kids while the other parent does the shopping. This means that we usually pick out our kids’ clothes and they just have to work with whatever we pick. Since they are currently 7 and 4, this isn’t too big of a problem. But my 7-year-old daughter has recently had more of an opinion about her wardrobe. What I love about thredUp is that we can shop together for her new clothes and I still don’t have to step foot in a store. A few months ago she wanted some new dresses. I grabbed my phone on the way to church, pulled up the thredUp app, created a refined search and told her to pick what she liked. She added several dresses to the cart and handed the phone back. I narrowed down her selection just a bit and pressed the checkout button. Her new dresses arrived later that week. Easy peasy. Convenience – in bed, in the car, on your lunch break, you can shop from anywhere. They have an easy to navigate website and a rockstar app that makes searching and ordering a breeze. Affordability – You can get clothes for as low as $.99 and they regularly have coupons and other deals to take advantage of to make their prices even better. Huge selection – you could (and I have) spend hours and hours browsing through their giant selection and still never reach the end of just your size. There are tons of options. Free Returns if you choose store credit. Fantastic quality and packaging. The quality of each item is clearly described. Everything is triple checked for stains, pilling, or fading, so there are no surprises. They also take great care in packaging your order. They try to achieve a beautiful “unboxing” experience with everything folded carefully in tissue paper. As with all online shopping you, of course, are not able to try on your items before you buy. However, their 14-day free return policy means you can send back anything that doesn’t fit quite right. The best deals can be found “off season”. This isn’t a terrible con as this is the norm when shopping. But if you’re looking for the cheapest items, you will usually find tank tops and skirts in the winter and sweaters and hoodies in the summer. The shipping is fast, but it’s not “Amazon fast”. I usually have to wait about 5-7 days to receive my items. I feel like there was a bit of a learning curve for me to find exactly what I was looking for on thredUp. Because they have such a huge selection, it does take a while to figure out exactly how to use the filters to find just what you want. Here are the steps I now take to find just what I’m looking for. I have done nearly all of my shopping through the thredUp app (instead of the website) and I feel like it is just slightly easier to filter that way. First, start by selecting the category (women, boys, or girls) and the proper subcategory (pants, dresses, shirts, etc) for the type of item you’re looking for. Next, refine your search with the size you need, and any other options you’d like such as brand, style, or color. I usually start by setting the Condition to “New with tags” and then expand to “Like-New” if I need more options. I have purchased a few “gently used” items and I don’t think I would do that again, so I just stick with the New with tags and Like new and everything is perfect quality. Instead of refining by price (which doesn’t always work well), I change the “sort by” option to Lowest price so I can see the cheapest options first. Hit Apply and shop away! Remember, if you order at least $79 worth of items you get free shipping, so it can be beneficial to purchase many items at once. You can always return anything that doesn’t fit perfectly. I wanted to make a quick note about selling with thredUP. This is something I do not have any experience with. I personally do not take the time to try to sell clothing through consignment stores as I’ve found that we usually don’t have clothes that are high enough quality to make this worthwhile. I have heard from others who have attempted to sell with thredUP that it is not a great way to make money since they tend to only accept high-quality items and the payout is fairly low. You are more than welcome to try it out, but personally, I prefer to save time and drop all of our old clothes off at a donation box near our neighborhood. 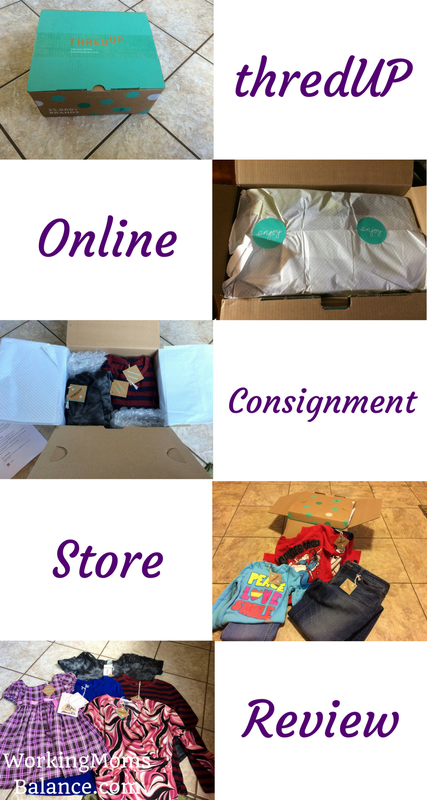 Have you ever purchased clothes from thredUp or another online consignment store? What has your experience been like? If you’re completely new to online shopping, this post about online Christmas shopping might help you get started. Are you on Facebook? Be sure to like our page to stay connected! Don’t forget – If you want to order from thredUP for the first time, click this link to save $10.